SpaceX Archives - ENTERPRISE LINUX I.T. 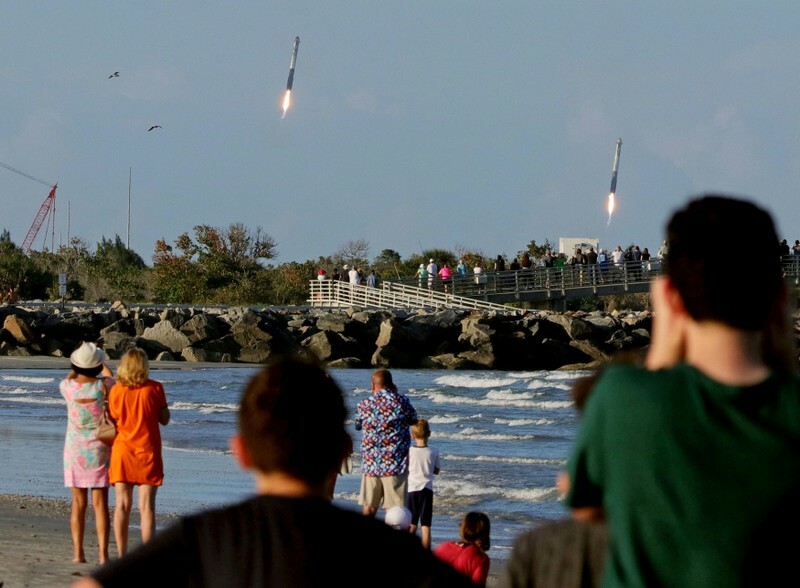 Spectators watch from Jetty Park as booster rocket engines approach landing pads, after a SpaceX Falcon Heavy rocket, carrying the Arabsat 6A communications satellite, lifted off from the Kennedy Space Center in Cape Canaveral , Florida, U.S., April 11, 2019. REUTERS/Joe Rimkus Jr.
(Reuters) – The most powerful operational rocket in the world, SpaceX’s Falcon Heavy, launched its first commercial mission on Thursday from Florida in a key demonstration for billionaire entrepreneur Elon Musk’s space company in the race to grasp lucrative military launch contracts. The 23-story-tall Heavy, which previously launched Musk’s cherry red Tesla roadster to space in a 2018 debut test flight, blasted off from Florida’s Kennedy Space Center carrying its first customer payload. “T plus 33 seconds into flight, under the power of 5.1 million pounds of thrust, Falcon Heavy is headed to space,” SpaceX launch commentator John Insprucker said on a livestream. Roughly three minutes after clearing the pad, Heavy’s two side boosters separated from the core rocket for a synchronized landing at the Cape Canaveral Air Force Station, sparking boisterous cheers from SpaceX engineers in the company’s Hawthorne, California headquarters. The middle booster, after pushing the payload into space, returned nearly 10 minutes later for a successful landing on SpaceX’s seafaring drone ship 400 miles (645 km) off the Florida coast. In the 2018 test mission, Heavy’s core booster missed the vessel and crashed into the Atlantic Ocean. “The Falcons have landed” Musk wrote on Twitter, inaugurating the first successful recovery of all three rocket boosters, which will be refurbished and re-fly in another Falcon Heavy mission this summer to carry a swarm of military and science satellites for the Air Force. Liftoff with Heavy’s new military-certified Falcon 9 engines was crucial in the race with Boeing-Lockheed venture United Launch Alliance and Jeff Bezos’ Blue Origin as Musk’s SpaceX, working to flight-prove its rocket fleet one mission at a time, aims to clinch a third of all U.S. National Security Space missions – coveted military contracts worth billions. The U.S. Air Force tapped SpaceX in 2018 to launch for $130 million a classified military satellite and in February added three more missions in a $297 million contract. SpaceX and Boeing Co are vying to send humans to space from U.S. soil for the first time in nearly a decade under NASA’s Commercial Crew Program. SpaceX’s Crew Dragon capsule, atop a Falcon 9 rocket, cleared its first unmanned test flight in March ahead of its crewed mission planned for July, while the first unmanned test for Boeing’s Starliner capsule is slated for August on ULA’s Atlas 5 rocket. Falcon Heavy carried a communications satellite for Saudi-based telecom firm Arabsat, which will beam internet and television services over Africa, Europe and the Middle East. Privately owned SpaceX, also known as Space Exploration Technologies Corp, was founded in 2002 by Musk, who is also a co-founder of electric car maker Tesla Inc.